Cherry season is here! Cherries are now everywhere and their bright red color beckons. They’re so beautiful, juicy and delicious, it’s impossible to resist them. Time to make all those incredible cherry desserts we’ve been waiting so patiently to create and consume. I love this cherry compote. It’s got lots of cherry richness, just enough red wine and just enough spice to make it an incomparably superb accompaniment to ice cream, panna cotta, cheesecake or chocolate cake. 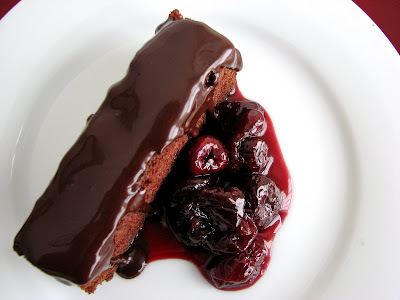 Since I had some Devil’s Food Cake left over from another experiment, I decided to use it to dress up the cherries along with some gooey dark chocolate sauce. This is an incredible dessert with a great combination of complementary flavors. The Devil’s Food Cake comes from Flo Braker and is one of the most delicious and tender cakes you’ll ever bake. All of the ingredients are in perfect balance so the flavor and moisture are supreme. Once you bake this cake it will become part of your permanent repertoire. The deep dark Chocolate Sauce delivers an interesting sensory contrast to the light delicate cake and the rich fruit of the Cherry Compote. I hope you have the chance to make this soon while cherries are dancing across our shelves. - I used a cabernet sauvignon for the Cherry Compote. You can also go with a fruity zinfandel. - If you don’t have crème de cassis for the compote, you can substitute your favorite tawny or ruby port. - Double the recipe for the Devil’s Food Cake, add your favorite frosting and you have a fabulous layer cake. - The Chocolate Sauce will keep refrigerated for several days. Preheat your oven to 350 degrees. Prepare an 8” x 3" cake pan with butter, parchment and a light dusting of flour. Combine all the ingredients except for the cherries in a saucepan. Bring to a boil and then reduce heat to a slow simmer. Add the cherries and simmer on low heat until the liquid is syrupy and has reduced, about 30 minutes. Remove star anise, vanilla bean, bay leaf and peppercorns. Cool. 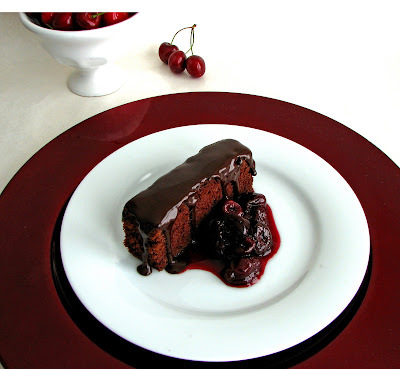 Serve the cake with a glaze of Chocolate Sauce and garnish with Cherry Compote. This is great! My husband always requests a Black Forest Cake for his summertime b-day. Your cake recipe looks like a delicious alternative. Many thanks. I've been dying to get my hand on some good cherries and now thanks to you I'm dying to try this recipe! Oh my it's so yummy looking! If you don't mind I'd love to direct Foodista readers to your blog. Just add your choice of widget to this post and you're all set! What a yummy looking dish. I love the look of that chocolate sauce. 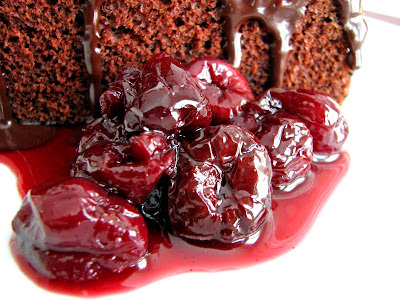 This is so decadent and luscious, I love cherries. I just bought 2 bags at the store today, just in time for this post! i'm really glad to see this post. friends of mine who are too purist about desserts say that fruit doesnt or shouldnt go with chocolate cake. cherries or berries especially-- but also other fruit-- and chocolate often work great together (helloo, cherry cordials...?). plus, when you play up different flavors and textures between the two, all the better. i'm curious to know about your cocoa. i've picked up some bulk non-alkalized cocoa because it's inexpensive for tests (i actually like some of the bitterness), but you cant really use it interchangeably with Dutched. what's your take on it? Bryan, I'm usually a purist, too. But I spent a year working with chocolate exclusively and since I'm more of a fruit person, I just can't resist. It can sometimes be difficult to find the right balance of acidity when creating a composed dessert with fruit and chocolate, but it's lots of fun trying! As for cocoa, I've tested some recipes using both dutched and undutched and have not found a significant difference. but that really depends on the type of recipe and the alkalinity and acidity of the other ingredients. So I wouldn't necessarily say they are interchangeable, but it may be worth testing your favorite recipes. I used undutched for this recipe. Valerié-jeanne, just add a dollop of whipped cream and your set! I have to admit that I am not one to like fruit and chocolate together but this post has me wanting to try again. It's not that I am a purist, but it's just a question of taste. I am more chocolate-caramel-nut than chocolate-fruit but if you bring cherries on the plate...well now that's a different story!! omg this looks sinful. beatifully delicious. definitely gonna try this. thanks for the recipe. This would go well with our coffee business. Hi. Could you please help me out. I'm having trouble identifying the Australian versions of 3 of the American named ingredients in the recipe for the Devil's Food Cake. 1) Is cake flour plain or self rasing flour? I supect it's plain flour, as you have baking soda in the ingredients, but this just leads to another question: 2)Is baking soda bicarbonate of soda or baking powder (mix of bicarbonate of soda and cream of tartar?) Again, I suspect it's bicarbonate soda as there is buttermilk in the ingredient list, which gives a required acid that cream or tartar would provide, but I'm still not experienced enought to know this for sure. And lastly, 3) is granilated sugar the same as Australian caster sugar (fine grained, more so than regular sugar, but not as fine as icing sugar? 1 cup cake flour = 1 cup bleached all-purpose flour minus 2 tablespoons, then + 2 tablespoons cornstarch mixed in. 1 cup self-rising flour = 1 cup all purpose flour + 1 1/2 teaspoons baking powder and 1/2 teaspoon salt. Baking soda is the same thing as bicarbonate of soda. Caster sugar is finer than granulated sugar but perfect for baking. I believe you call all-purpose flour "plain flour" in Australia. I know it can be confusing to work with these differences when you live in a different region! Hi! I made the devil's food cake to eat with coffee creme anglaise. The cake is a simple one, and too sweet for my taste (I'll half the sugar content next time), although my partner didn't find it too sweet (but he tends to like sweeter foods anyway). 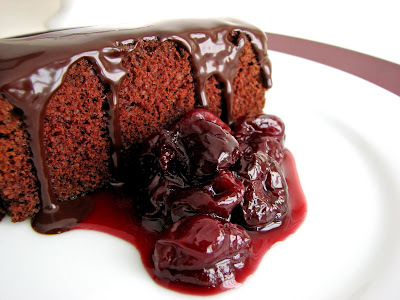 I wonder if eaten with the chocolate sauce and spiced cherry compote will balance the sweetness better. Otherwise, I think your suggestion in the bench notes to double the recipe and turn it into a layered cake is good, and I've noticed David Lebovitz has sandwiched his version with a butter cream on his blog (thanks for introducing me to his site -it seems I have been living under a rock!) so next time, I'm going to make a coffee flavoured butter cream and turn this into a layered cake. Thanks again for all your generosity and guidance. Now, I see you've posted a new recipe, so off I go!